For a detailed History of the early Church in Florida, please see the article under this menu item by Dr. Charles Gallagher, SJ. The history of our Catholic faith in Florida begins with the earliest of the Spanish conquistadors to visit what is today the Dioceses of Orlando and St. Augustine. In 1539 Hernando de Soto led an excursion that entered Florida's modern Tampa Bay area. Eight priests were with him in his exploration traveling up into Marion County on his way north. There were many who followed, especially after 1565 when the Spanish permanently settled in St. Augustine. The early missionaries reached out to the local people and helped them develop a written version of their language. 300 years later, when the first Florida Bishop arrived, there were already 5 Catholic communities established – St. Augustine, Jacksonville, Pensacola, Fernandina and Tampa. Bishop Augustin Verot began the modern organization of the Church in Florida. The Bishop faced the vast mission before him with a handful of priests, undeveloped counties and swamp-ridden villages, where communities were struggling to begin. During his administration between 1870 to 1876, there were missions and mission stations sparsely settled around Central Florida, but he did not establish any parishes. He died on June 10, 1876 weary after years of trying to get things established for the Indians, and for his American Church. The next Bishop of St. Augustine was Bishop John Moore from 1877 to 1901. In his term he established 5 parishes and 4 missions in the Central Florida area. The parishes were St. Peter in Deland, St. James Cathedral in Orlando, St. Paul in Daytona Beach, All Souls in Sanford and St. Joseph in Lakeland. Hence, in the history of our Diocese of Orlando – these are the first parishes, followed by St. Mary of the Lakes as the sixth. The first Catholic arrived in Eustis in 1890. He was a man from Philadelphia named Charles Megargee. Six years later, another Catholic from the same city, Mr. Jerry Ott, came to Eustis and then there were two. So together they would make a trip to Sanford to attend Mass. Imagine the sacrifice they made as the roads were not paved. Father Fox started the Eustis station in 1906 by celebrating the first Mass in Mr. Megargee’s home. In 1911, the Catholic community had grown, and Eustis was established as a Mission of All Souls Church in Sanford. Father Bresnahan helped to prepare for a Eustis church. Property was purchased on the corner of Grove and Badger Streets and a cornerstone was laid on Sept. 22, 1911. A donor of $1,500 asked that the new church be called “St. Mary.” The church was built of wood and stuccoed. 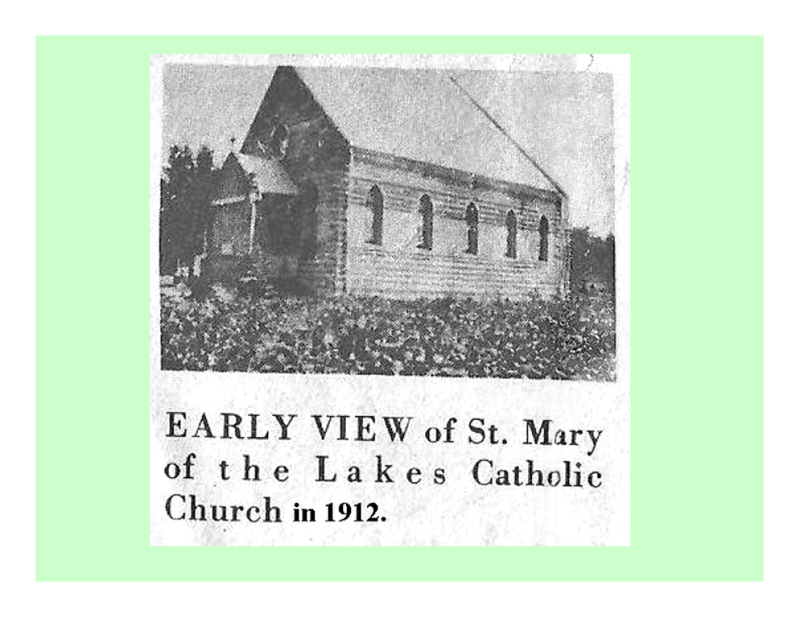 On Jan. 28, 1912, Bishop Kenny dedicated St. Mary of the Lakes. The church then served a dozen Catholic families who had been aided in funding the building by generous non-Catholics in the community. So that the very first day that St. Mary’s started it was debt-free. The church seated 50 worshippers. When the first funeral was held, the casket could not be carried through the narrow door, so the entrance had to be enlarged. Resident priests in the mission began in 1927 with Rev. William Humphries as the first one. A house was purchased for a rectory. Rev. Patrick Doyle, who served from 1933 to 1940, saw the need of adding space to the church for his growing parish. In June of 1936, he enlarged the church to seat 285 to 300 people. In 1961 St. Mary of the Lakes even crossed the county border of Seminole to start a Mission in Apopka . Rev. Michael Reynolds, pastor between 1957 to 1964, celebrated Sunday liturgies at first in the Apopka Memorial High School, and after 1964, in the American Legion Hall. The Diocese of Orlando was established on June 18, 1968. Most Rev. William Borders was the first Bishop of Orlando. At that time he governed 50 parishes serving 128, 000 Catholics. In 1969, overcrowding at St. Mary of the Lakes church led to the beginning of a mission in Mount Dora. It was Rev. William Trainor who started this mission and was succeeded by Fr. Michael Hannon. A one-day fund drive assured pledges of $ 26,000 towards a new church. By summer of 1970, Bishop Borders decided that the mission, named after Saint Patrick, had grown sufficiently to be a parish. Fr. Michael Hannon was Pastor of St. Mary of the Lakes for 17 years. The Church continued to grow and to prosper under his leadership. In 1972, Fr. Hannon proposed a 2-story multi-purpose building combining the church, parish hall, rectory and the office under one roof. The old rectory was torn down and on November 6, 1977 the cornerstone of the current building was laid. By Easter of 1979, the project was completed – St. Mary of the Lakes Church is now shaped like a dove in a very unique Spanish architecture. In 1986, Fr. Antonio Pons, our first Spanish priest became the pastor. In his six years of tenure, a new Parish Center building and a Rectory were completed in 1988. Fr. Manuel Fernandez replaced Fr. Pons in 1992. The following year, a Spanish Mass was added to the weekend schedule and in 1994 the Hispanic office was opened for the immigrants. The property ownership of the Parish expanded and in 1999 the present office building was erected on the corner of Ocklawaha Avenue and Grove Street. Also, in the same year a waterfall was added to the grotto at the front entrance of the church. In October of 2006, the last property on the corner of Ocklawaha Avenue and Center St. was purchased giving us the entire block except for one house on the North West corner of Osceola Avenue. In June of 2008, in commemoration of the Diocese of Orlando’s 40th Anniversary, Pope Benedict XVI elevated Fr. Fernandez to Monsigñor along with several other tenured priests. In December of 2008, the properties at 722 and 728 S. Grove Street across from the front of the church were purchased. The 722 property was renovated after the decision was made to open a Free Medical and Dental Clinic due to the generosity of several doctors in the area to help the needy who have no insurance. This Free Medical and Dental Clinic is a project of St. Mary of the Lakes and St. Patrick’s in Mount Dora. This project was approved by the Diocese with the condition that this will be under the umbrella of the Catholic Charities of Central Florida. The 728 property was converted into a Thrift Shop to help fund the Free Clinic. In May of 2010, St. Luke’s Free Medical & Dental Clinic and the St. Mary’s Thrift Store finally came to fruition. These two buildings were dedicated by Archbishop Thomas Wenski on May 2nd. On June 1, 2010, Fr. Gilbert Medina was assigned to St. Mary of the Lakes as Parochial Vicar. By September Fr. Medina was made the Parochial Administrator of St. Mary of the Lakes, when Msgr. Fernandez decided to retire, after 18 years of serving this parish. Fr. Medina was then installed as our 14th Pastor a year later. This young, vibrant and deeply spiritual man started a tradition at the Thanksgiving Day Mass for the attendees to bring a loaf of bread which would be placed at the altar and blessed during Mass. At the end of the Mass, the youngest member in the family is requested to take home a loaf other than their own and share with their family at their Thanksgiving meal. On January 23, 2011, Youth Stewardship Sunday was introduced and the children were made aware on giving back to God each week their Time – Talent – Treasure, and were asked to take home a box of envelopes to use with the God Jar instruction sheet. In celebration of the 99th Anniversary, the Filipino clergy in our Diocese of Orlando presented a concert in our parish on January 28, 2011. Seven priests came to perform in the concert entitled “Ah-Men” which was enjoyed by all. The installation of 2 large movie screens – one on each side of the altar was finished in October of 2011. The first family movie night was introduced showing the 13th Day, the story of the apparition of Our Lady at Fatima, Portugal. More than two hundred people came. The Altar was renovated on November 16th to make room in our sanctuary. The Tabernacle was returned to its original place at the center of the sanctuary. On November 23rd, six gold altar candlesticks, an altar cross, a gold book rest, a beautiful ambry to place the Holy Oils, and two additional tabernacle candle sticks were purchased from the donations of the parishioners. To put the final touch of our sanctuary, a decision was made in December to find three dimensional Stations of the Cross to replace the old ones made of tapestry. The Business Manager, Easter Byrne, was given the task to do the search. By Christmas, a collection of large and turn of the century, Stations of the Cross, perfect for our sanctuary were located from a Church that had been closed in St. Joseph City in the state of Missouri. It was the Church of the Immaculate Conception, founded in 1867. Donors were then procured. On January 10, 2012, fourteen beautiful and ornate Stations of the Cross were installed. The original cornerstone dated A.D. 1911 was placed at the main entrance of the church on January 17, 2012. The stone was preserved by the late Joe Shenk, who was the maintenance man when the old church was torn down in 1978. To commemorate the 100th Anniversary of St. Mary of the Lakes in 2012 – a number of activities were lined up. The most important to note was the Anniversary Mass on January 28th at 4 pm for which Bishop John Noonan was the celebrant. Burial of a time capsule at the front hillside of the church immediately followed after the Mass. This Time Capsule is scheduled to be opened in 2037. The 100th Anniversary Banquet was held at Lake Receptions in Mount Dora in the evening, where more than four hundred people came and enjoyed the dinner and dancing to the tune of the LC Swing Band. In March of that year, the Eustis Community Center was rented to hold our Heritage Festival. There we had a showcase of the many different countries where our parishioners came from offering their many delicacies. We also displayed all the liturgical items that our Parish had archived in the past 100 years and re-enacted the founding of St. Mary of the Lakes Parish. To close the Centennial Celebration, we celebrated the Feast of Our Lady of Guadalupe with an International Fiesta. A big tent was rented that covered the parking lot between the Church and the Parish Center and sat about 650 people. The Mariachi Band played during the Mass and after, as the festivities went on until 7:00 pm. Aztec Dancers and the Historical Society of St. Augustine also graced the occasion. A crowd of more than a thousand gathered and celebrated. It was a wonderful celebration! The 14th Pastor of St. Mary of the Lakes, Fr. Gilbert Medina, was passionate about history and became a member of the Historical Society of St. Augustine. Fr. Gilbert Medina portrayed Don Juan Ponce de Leon in 2013, celebrating the 500th Anniversary commemorating Florida’s discovery in 1513. A bus full of St. Mary of the Lakes parishioners as well as many in private vehicles went to St. Augustine to witness the event on April 6th. Everybody was proud of Fr. Medina. Fr. Gilbert Medina made a promise to God that he would complete a pilgrimage – The Way of St. James to Santiago de Compostela, famously known as the El Camino walk. He decided to fulfill this promise in 2014. He started his journey on May 26th by foot from St. Jean-Pied-de-Port in France and walked more than 500 miles for 6 weeks, completing the pilgrimage at the Santiago de Compostela Cathedral in Spain where he concelebrated the mass. Returning from his pilgrimage of 6 weeks, the parishioners were all happy to see Fr. Gilbert Medina in July, only to be broken hearted to know that after only 4 years of being the Pastor, he would be moving on. He was needed at All Souls Church in Sanford and was transferred on August 1, 2014. The parish remained without a Pastor for the next month and a half. Fr. Ed Waters, the Dean of Northern Deanery of which St. Mary of the Lakes belongs, came to assure everyone that the Bishop was actively looking for a good replacement. Fr. Joseph Roberts, the retired Pastor of Our Lady of the Lakes in Deltona, who was helping while Fr. Medina did his pilgrimage, continued to stay. Together with Msgr. John Neff, these 2 retired priests patiently served the parish while everyone anxiously waited for the next Shepherd. On the 16th of September, 2014 the Bishop appointed Fr. Joseph Bellerive, J.C.D. as the 15th Pastor of St. Mary of the Lakes. Fr. Joseph brought with him many years of experience as a priest in Notre Dame Cathedral in Paris, France. He is also currently the Adjutant Judicial Vicar of the Diocese of Orlando. Aside from being a Priest, he is also an accomplished opera singer and has performed in many places in Europe and in the United States. In December, Fr. Joseph started the first Saturday Mass at 8:00 am followed by a Question and Answer Session about our faith in the Parish Hall. The community welcomed this new forum to learn more about our Catholic Faith. In January of 2015, real vigil candles were placed in a stand on each corner of the Church for people to light for their special intentions, replacing the electric push button ones. In celebration of its 103rd Anniversary, the parish offered a Classical Concert performed by the talented Pastor. A crowd of nearly 600 gathered in the church and were truly entertained. St. Mary of the Lakes was indeed blessed to have a Pastor who willingly shared his knowledge of the Canon Law and his God-given talent in music to everybody. On the 2nd of December, 2018, Fr. Joseph returned to a full time position at the Diocesan tribunal and the Bishop appointed Fr. Carlos Bedoya as the 16th Pastor of St. Mary of the Lakes. We also have 24 different Pastoral Ministries, Church Organizations and outreach programs – New Parishioner Hospitality, Bereavement Ministry, Charismatico, Cursillo, Hispanic Ministry, Juan XXIII, Knights of Columbus, Ministry to the Sick, Office volunteers, Our Lady’s Sodality, Pastoral Council, Prayer Blanket Ministry, Respect Life, St. Joseph Ministry (Grounds Beautification), Widows and Widowers Group, St. Vincent de Paul Food Pantry, Gifts for the Soul, St. Mary's Museum, St. Lukes Free Medical and dental Clinic, St. Mary's Thrift Shop, Count team, E-Giving, Finance committee, Youth Stewardship. In order to meet the call to continued formation, St. Mary of the Lakes offers 26 different opportunities to our parishioners – Adult Bible Study, Baptism - English, Baptism – Spanish, Beloved Pre-Cana Retreat, Calls to Knowledge and Understanding: Family of Faith Program (Elementary), Call to Reverence (Catechesis of the Good Shepherd Pre-K program), Calls to Right Judgment & Fortitude (Middle School Formation), Call to Wonder & Awe (First Reconciliation & Communion), Call to Wisdom (High School Formation), Catechesis for Individuals with Special Needs, Monthly Family of Faith Community Events, Fully Engaged Pre-Marriage Program, Joy-Filled Marriage Program, Lenten Eucharist Program, RCIA – English, RCIA – Spanish, Small Christian Communities, Theology of the Body for Teens, Totally Catholic Vacation Bible School, Cristo Joven & Corazon de Maria (Youth Ministry), Summer Youth Camp, Steubenville Youth Conference, Quinceañera Chastity program, Y-Disciple (Peer Ministry). We are hoping to implement some new programs in the next year including: NFP Training, Grief support, Divorce support, Mom's group, Catholic Parenting, Blue Knights Boys Club, Little Flowers Girls Club, Legion of Mary and Catholic Stewardship. Please contact the office if you would like to help with these new programs. We also hold some annual events which build community and help raise funds for our Ministries, Clinic and Food pantry – Walk for the Poor, Our Lady of Guadalupe, Our Lady of Providence, International Festival, Opera Concerts, project Psalm 144. The Parish office staff is composed of – Fr. Carlos Bedoya, our Pastor. Kathy Hopkins is the director of operantions. Lia Keen, is the Parish Secretary. Ana Ramírez, is the Administrative Assistant and takes care of the bulletin. Jackie Smart is our Parish Catechetical Leader and she is also our Youth Minister and the parish technology representative. Kris Currid heads our Music ministry along with volunteers who work with both the English and Spanish communities. Maria Díaz, is the housekeeper, and Angel Garcia, is in charge of maintenance. Today, St. Mary of the Lakes has 1,639 registered families and 4059 recorded members. In its growth, it has acquired 11 buildings in a five-acre property.